Welfare Not for Profit The Brotherhood of St Laurence has launched a new campaign and a monthly Youth Unemployment Monitor, in response to what it describes as “youth unemployment in Australia hitting crisis point”. Brotherhood Executive Director Tony Nicholson said the new campaign, My Chance, Our Future, seeks to highlight youth unemployment so Australians can start tackling the crisis together. Launching the campaign, the Brotherhood issued the Australian Youth Unemployment 2014: Snapshot and a series of maps indicating the level of youth unemployment in different states and cities. It also released a new monthly publication – the Youth Unemployment Monitor (the Monitor) – to provide a regular source of current information and policy analysis. This month’s Monitor includes an introduction by former News Ltd chief John Hartigan, key facts and analysis, as well as some of the human stories of youth unemployment, told by young people. Hartigan has backed the My Chance, Our Future campaign and expressed his strong concern about the impact of youth unemployment in communities across the nation. “Make no mistake: no skills, no job, no quality of life,” he warned. 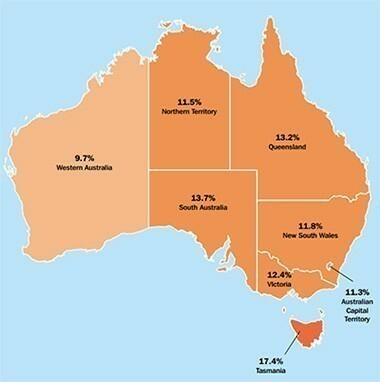 The Brotherhood’s analysis of the latest ABS data shows the unemployment rate for those aged 15 to 24 at an alarming 12.2 per cent across Australia in the year to January 2014. This was up from 8.8 per cent in 2008. In the month of January, youth unemployment in Australia hit 13.4 per cent. Until the onset of the global financial crisis and global recession, long-term youth unemployment in Australia had been trending downwards. However, the Brotherhood’s analysis shows that over the past two years the rate of youth unemployment has been on the rise. The Snapshot reveals the situation is even worse in a range of youth unemployment hotspots across the country. Youth are especially bearing the brunt in outer suburban, regional and rural areas. 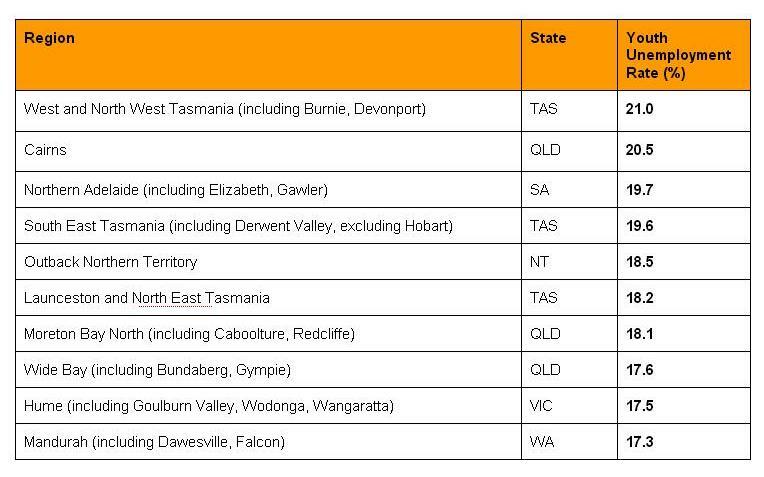 This table shows the top 10 hotspots for youth unemployment over the year to January 2014. Nicholson said the data showed a crisis that Australians could not afford to ignore. “Youth unemployment as high as 21 per cent in some areas of our country is a scandal for our young people, our communities and our economy,” he said. “It’s a disaster for our young people who want to work but are getting locked out of the workforce and locked into welfare dependency because they have no choice. “It’s a disaster for communities, leading to more homelessness and despair for young people and their families. And it’s a disaster for the national economy and for taxpayers who will end up paying the bill,” he said. “It's time to invest now in our young people so they can contribute to society. Young people tell us all the time that they want to work. The Foundation for Young Australians (FYA) applauded the Brotherhood for launching the Monitor, and urged Australian employers to address the issue by taking responsibility for providing opportunities for young people to participate in the workforce. FYA’s CEO Jan Owen backed the assertion made by Nicholson that, despite the current premium placed on skills and workplace know-how, many young people are not given the opportunities to gain those skills. Owen said a major barrier for young people entering the labour market is a mismatch between the skills that employers are seeking and those with which young people are leaving formal education. Research by McKinsey indicates that while 72 per cent of education providers thought university graduates are prepared for entry level positions, only 42 per cent of employers and 45 per cent of young people agreed. Owen said it’s crucial that employers start taking a lead in ensuring that young people are equipped to participate in the workforce. As previously reported by Pro Bono Australia, community organisation Mission Australia believes Australia could be on the brink of a jobless generation unless the Federal Government makes youth unemployment a priority in the May Budget. Details of the My Chance, Our Future campaign can be found here, and the first issue of the new monthly Youth Unemployment Monitor is available here.